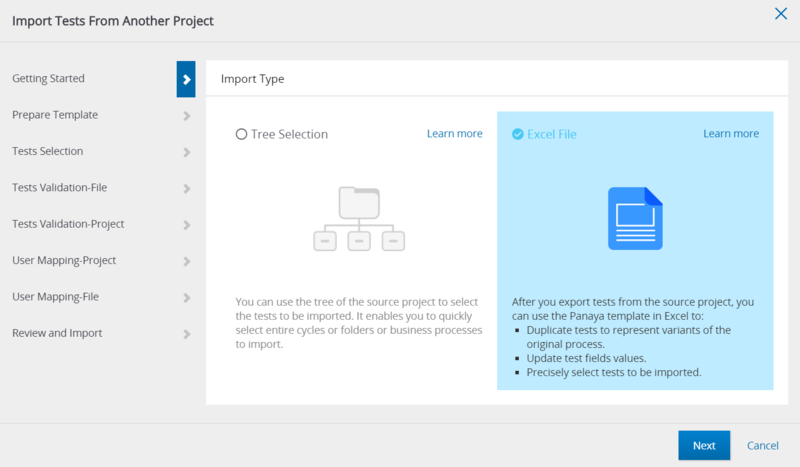 Panaya Success Center How to import Tests from another project, using an Excel file? When importing Tests and/or Quick Tests from another project, you can select to import using an Excel spreadsheet. Right click on any node in the Tree. Select Import and then Import from Another Project. - You will need to access the source project and take note of the Test or Quick Test ID numbers, path location (Cycle, Folder etc.) and Test Names to be imported. We recommend using the Test Steps Export option to easily retrieve this information. Test ID (mandatory) - Use this field to specify the ID number of the Tests or Quick Tests you wish to import. ID numbers should be identical to the IDs in the source project from where you wish to import the activities. Path (mandatory) - Use this field to specify where in the target project's Test Tree you wish the imported activities to appear. IT Owner and BP Owner - Use these fields to define the IT or Business Process owner. 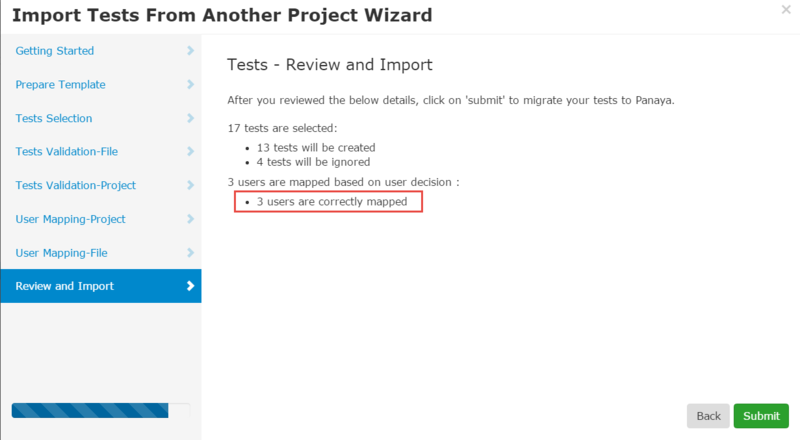 In the User Mapping phase of the wizard, you will be able to map these users to actual target project users (see instructions below). If you specify any other values for other fields in the Excel template, Panaya will overwrite the details in the original test of the source project. The newly created (copied) activities will include the provided values. When you are done filling in all details in the template, save it locally and click Next in the Wizard. 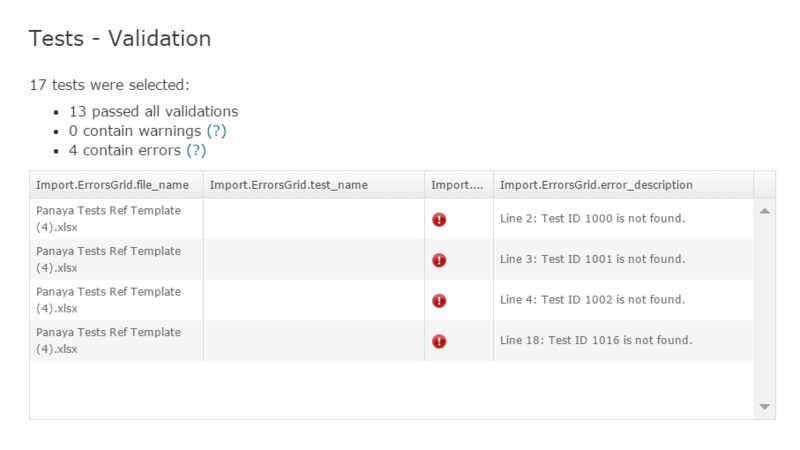 Fill in *blank* for any field, and Panaya will clear the values for the this field in the target project. 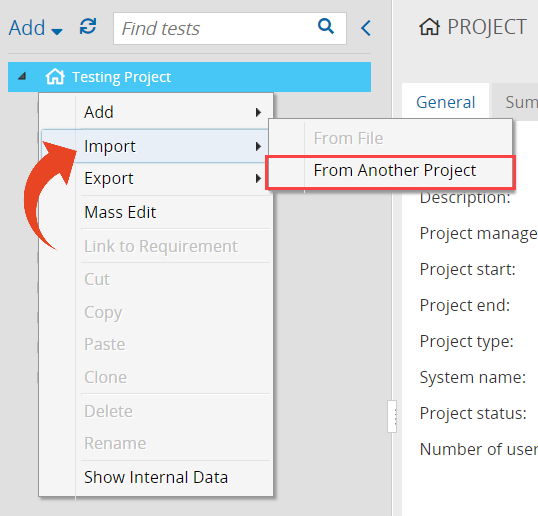 Use the Project drop down list to specify the source project from where you wish the newly created activities to be imported. Then click on Choose File to browse and locate the saved template file. Click Next. Panaya will display a validation report, highlighting any warnings or errors. For exmple in the screnshot below, you can see that Panaya did not locate test IDs 1000, 1001, 1002 and 1016 in the source project. You can go back and make changes to your Excel file, or you can skip the import of these specific activity IDs. If you populated the IT Owner or BP Owner fields, follow the instructions for User Mapping using a template file below. Otherwise, the Wizard will skip this phase. Panaya will display a summary of the import details. Click Submit to import. Panaya allows you to connect the IT Owner and Business Owner users to the actual project users within the target Panaya project. You can skip User Mapping by selecting Auto Mapping. In this case users will be mapped based on previous mapping (if available). In the User Mapping page, select to download the user mapping file and save it locally. For new users, type in the active email address, first and last name. 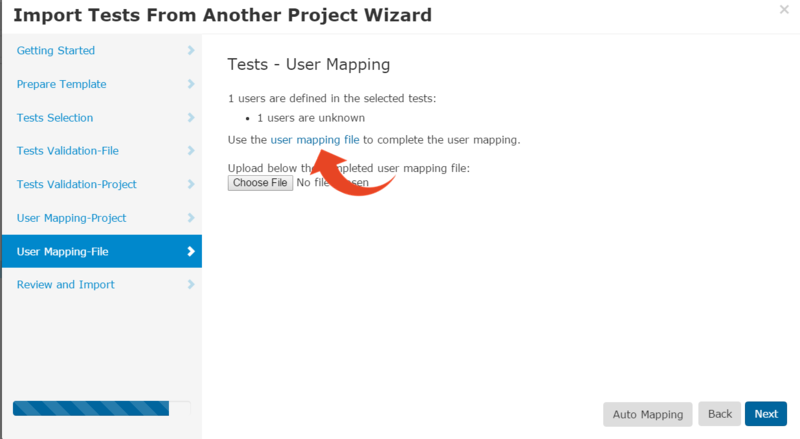 Go back to the Import Tests Wizard, and click Choose File to select the Panaya User Mapping XLS file. Process with the wizard until you submit your Import request.